Kansas City Chiefs’ Dee Ford was an afterthought in the AFC West when considering edge talent, as Khalil Mack, Joey Bosa, Melvin Ingram and even his teammate Justin Houston were all held in higher regard than Ford prior to the start of the 2018 season – that is no longer the case. Yes, Mack now suits up for the Chicago Bears and Bosa hasn’t played a down this season, but Ford isn’t just better than the rest of his AFC West rivals; he’s the best edge defender in the NFL through Week 8. The former Auburn product’s 90.5 overall grade and 91.9 pass-rush grade lead all players with 200-plus defensive snaps along the edge this season. Propping up his 91.9 pass-rush grade is Ford’s high-end efficiency going after the quarterback. He and Philadelphia Eagles’ Chris Long are the only two edge defenders with 200-plus pass-rush snaps with a win percentage above 20%. Ford’s pass-rush productivity (11.1) also ranks second behind just Buffalo Bills edge defender Jerry Hughes, and he’s out-snapped Hughes by 70 pass-rush snaps so far this season. Ford leads all edge defenders with 45 total pressures, including 26 hurries, 10 quarterback hits and nine sacks. In addition to pressures and pressure efficiency, time to pressure also affects PFF’s pass-rush grade, for pressures recorded earlier in the play have a heightened effect on the passer and more often lead to bigger defensive plays (i.e., strip-sacks, turnover-worthy throws). And no edge defender is better at forcing quick decisions than Ford. 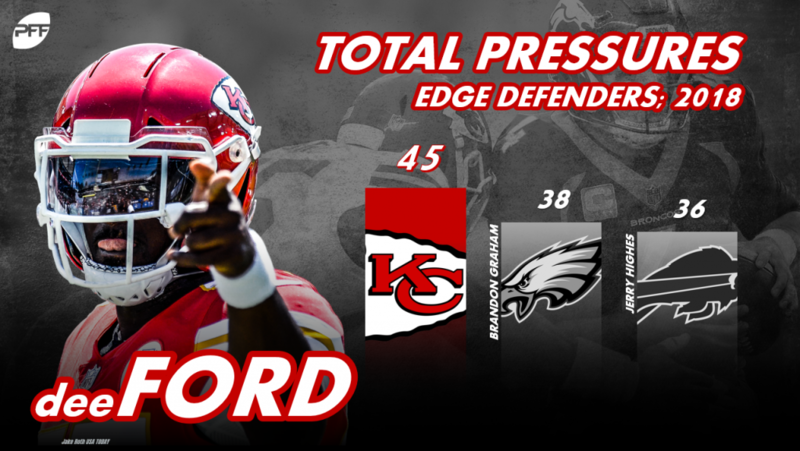 Ford leads all edge defenders in total pressures (19) on passes of 2.5 seconds or less, a testament to his ability to beat his opponent early in the down. Los Angeles Rams’ Aaron Donald (25) is the only defender with more this season. As a run defender, Ford isn’t among the league’s best, ranking 21st among 47 qualifiers in run-defense grade (69.7). But, more importantly, he’s far from proven to be a liability against the run, which, when combined with his elite play as a pass-rusher, is more than enough for the Chiefs’ defense. He has recorded just six run stops and two tackles for loss/no gain and missed one tackle in run defense. Ford is the class of the position, and no one saw it coming. The 6-foot-2, 252-pound Ford was knocked as an undersized edge defender coming out of college, but his elite acceleration and burst off the snap has always been one of his strengths. He didn’t adjust to the speed of the NFL as quickly as Kansas City would’ve liked as a first-round pick and battled injuries just as he started putting it all together in 2016 and 2017, keeping him within arm’s reach of the bust label throughout his career. Now, Ford is within arm’s reach of the quarterback more often than not, ditching the infamous bust label and chasing Donald for Defensive Player of the Year honors.